Let's have a little pillow talk here on Seek Adventure tonight. Ultra light backpackers are probably shuttering at the word “Pillow” mentioned in conjunction with camping, but I am all for them! I have been there, trying to be super light but now I just go light where it makes sense. I do not mind sacrificing a little weight for some added comfort at night. I have tried using clothes jackets, and even my pack as a pillow in the past. Don’t get me wrong all those non-pillows have all worked, but a good nights sleep on a dedicated pillow I think does a world of difference for you mentally on the trail. 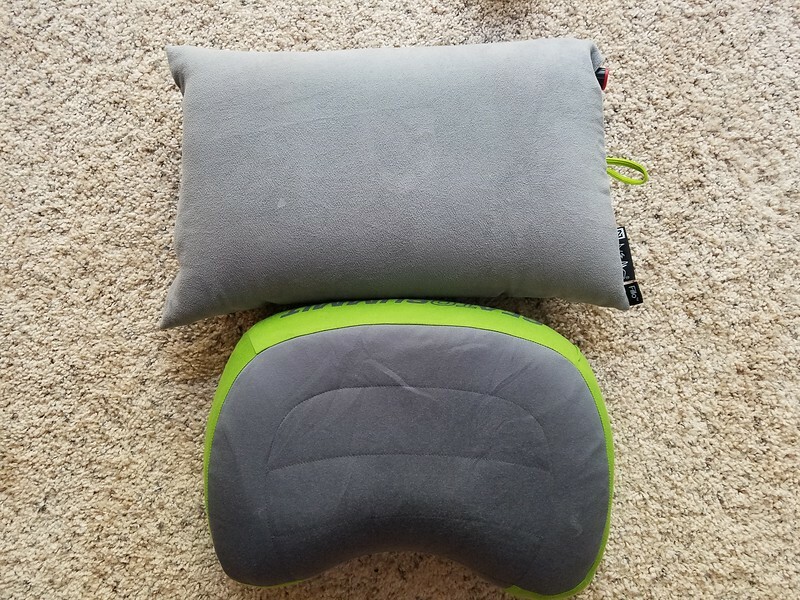 Let's talk about what I think are two of the best backpacking pillows on the market today, the Nemo Fillo and the Sea to Summit Aeros Premium. For Pillows, you can see both pack up pretty small but the Sea to Summit Aeros Premium is shockingly small and light. Although the Nemo Fillow isn’t exactly huge when packed up, the weight difference between the two is very noticeable. The nozzle you use to blow each pillow up may be something that you overlook, but each company handles this very differently. 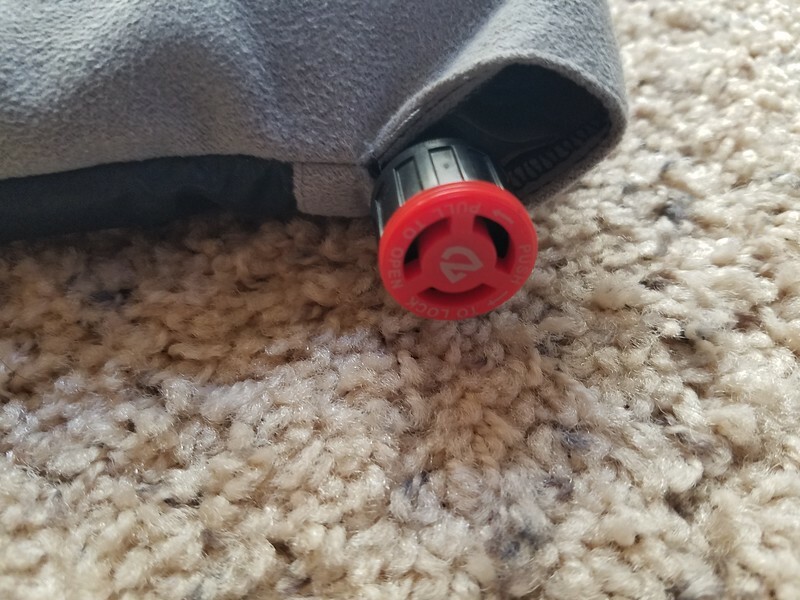 The Sea to Summit Aeros Premium has a unique valve on the underside of the pillow. To inflate you peel back the first park and there is a check valve right underneath. In between breaths you can take your mouth off the valve and air will not come rushing out. This valve is super simple and easy to use, and I love the fact you can take a break in between breaths and not lose any air. You can also tap the check valve to slowly let out a little air, or completely open it to let everything out all at once in the morning. The air valve on the Nemo Fillo is one of my least favorite things about this pillow. To blow the Nemo Fillo up, you turn the valve left and pull out to open it. This is not a check valve so in between breaths if you want to take a break you have to push it in and keep the pressure on it, and or completely close it by pushing in and turning it to the right. Its just not as natural, and frustrates me more than it probably should. Also when you push it in and turn it to the right, there is no real satisfying feedback which has caused me to not close the valve all the way multiple times and having to re-inflate. If we compare the pillows only on the valve, the Sea to Summit wins hands down. Its ease of use, and ability to easily let out a little air at a time to fine tune the comfort is amazing. As you can see in the above picture, the Nemo Fillo is more of a traditional pillow shape than the Sea to Summit Aeros and has a little bit more surface area. The Sea to Summit Aeros is curved a little and hugs your neck and keeps you from rolling off its smaller surface area. 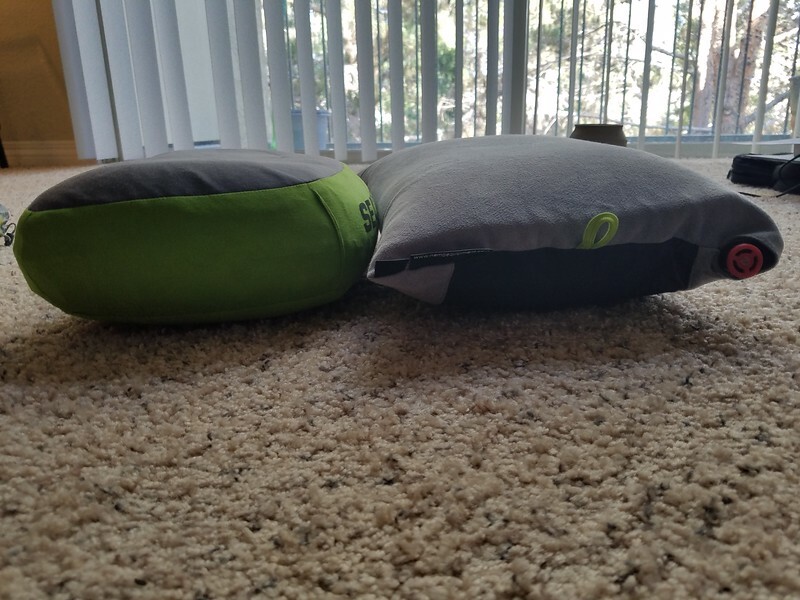 From a side view, both Pillows are very similar in height when fully inflated with the Sea to Summit Aeros just a little bit thicker. The Sea to Summit Aeros is covered in a very soft comfy outer on both the top and bottom. The only way to describe it is smooth soft and comfy. The Nemo Fillo is covered on top with a fairly similar material but on the bottom has a more nylon type of material. Originally the nylon material on the bottom of the Nemo Fillo did not sit well with me. I pictured the nylon sliding off of my sleeping pad. 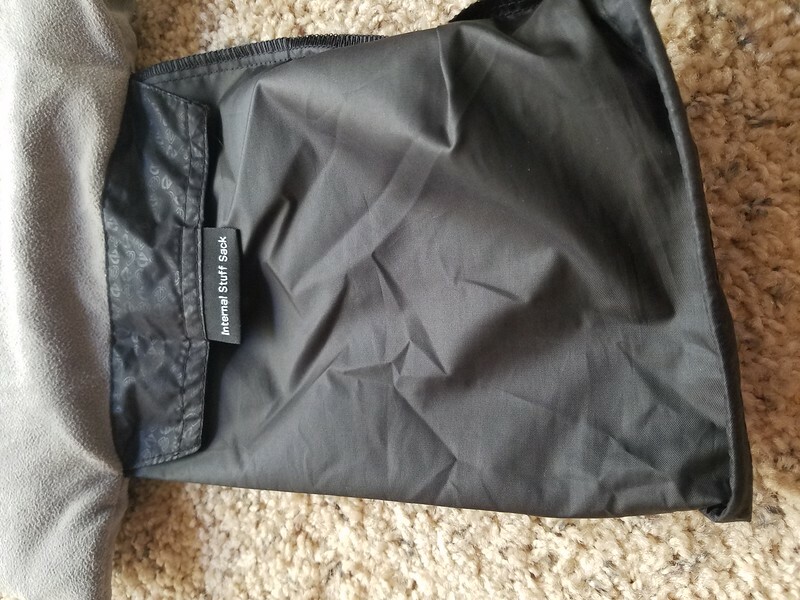 I have not had thorough testing with this pillow on a sleeping pad, but used it in the desert for over a month without one and feel like the nylon bottom helps keep it clean when sleeping on the ground. Also, the Nylon bottom will help protect it from puncture if using straight on the ground versus the soft material all the way around on the Aeros. One great feature of the Nemo Fillo is the internal stuff sack. When you deflate the Fillo and want to pack it up, it rolls up into its self. This is great at the end of a long day hiking because you have nothing to lose. 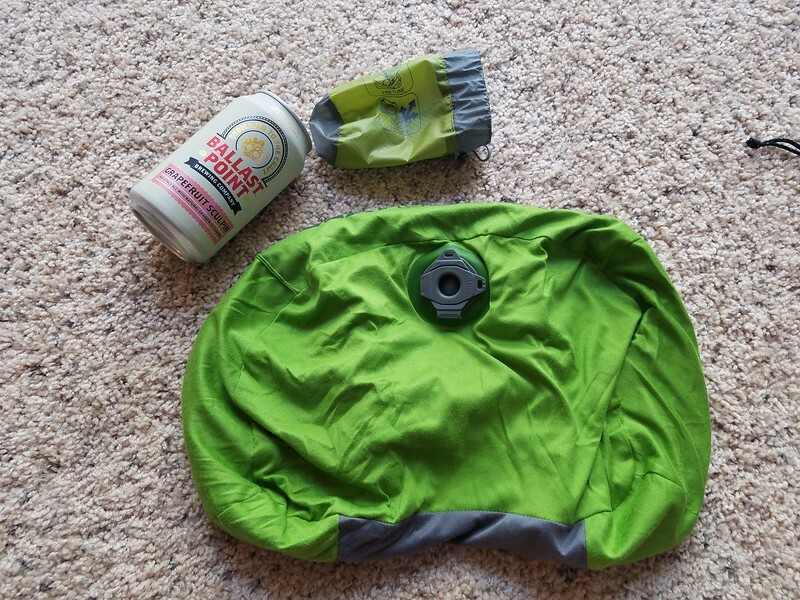 The Aeros packs up super small and is nice and light, just make sure you do not misplace the super small stuff sack too! The Sea to Summit Aeros was the first of the two backpacking pillows that I purchased. I was originally skeptical of inflatable pillows, picturing myself trying to sleep on a balloon you would get at a fair. 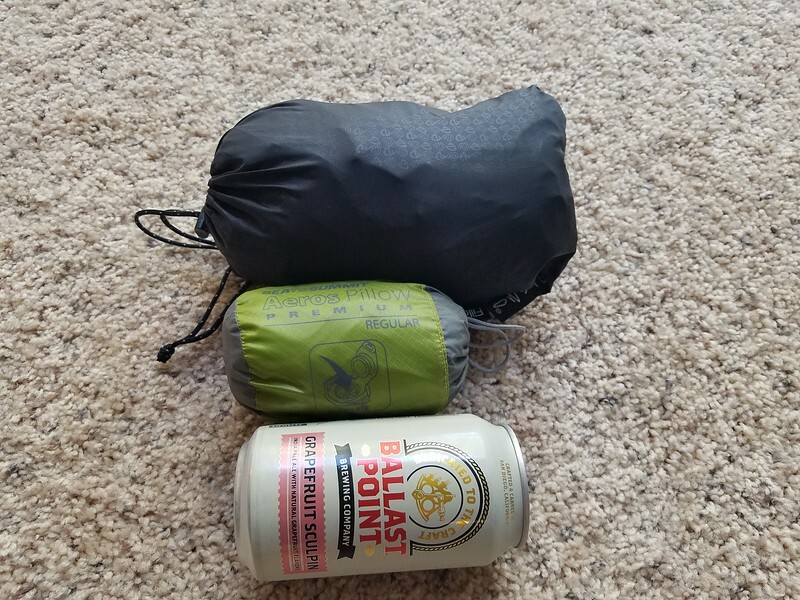 I carried the Aeros over 75 miles and used it every night through the High Sierra Trail up to Mt Whitney. This pillow not just satisfied me, but was my favorite piece of gear on the trip! I loved it, and slept great on it, both on my back and on my side, I really had no complaints, its a great pillow and surprised me! The Nemo Fillo was the second inflatable backpacking pillow that I purchased and has one major difference that separates it from the Aeros. The Fillo is also inflatable but what adds to its bulk and weight is that on top of the inflatable bladder is about an inch of memory foam! The memory foam adds to its weight but adds a plushness that makes it feel a little more like a normal pillow. The Fillo is essentially a hybrid. Both pillows are comfy, and its honestly hard to say which one I prefer. If weight is not an issue, I will most likely pick up the Nemo Fillo over the Sea to Summit Aeros due to its memory foam topper despite my gripes about the air nozzle.